Bees. So harmless Until You Are Stung! In the process of bringing in some freshly pulled oregano, I got stung by a wasp or bee. It was too dark to tell whether it was a wasp or a bee. Apparently, the bee or wasp must have been sucking the nectar of the oregano flowers. In trying to bring in too much stuff from the garden, I pressed the oregano against my chest to balance everything I had in my hands. Then, I was stung right near my heart. You can’t imagine how that felt. It hurt like a son of a b*tch. Now I know how Vampires feel when stabbed in the chest. But this time, it was in my chest where there isn’t a lot of fat. My survival skills set in because I thought I was going to die. (And the envelope goes to Anna for her Oscar performing role as a bee femme fatale.) Grabbing for the ice, I whimpered for hubby to help me. You have to feel for someone who got stung in the chest. The funny thing is I normally would have winced at putting cold ice on my chest. Yep, no towel. Just plain ice. I am telling you. Survival mode cures fear. In addition, if you have been stung multiple times and have any of these symptoms, seek emergency help. Dr. Google suggested the following remedies after you remove the bee stinger. I didn’t have one so I assume that it was a wasp. Vinegar (Most said to use in conjunction with baking soda and meat tenderizer.) Vinegar neutralizes the venom. Toothpaste (thanks to @Tanya Meyers from the GT fan page.) The glycerin apparently dries out the venom. Honey was listed too. 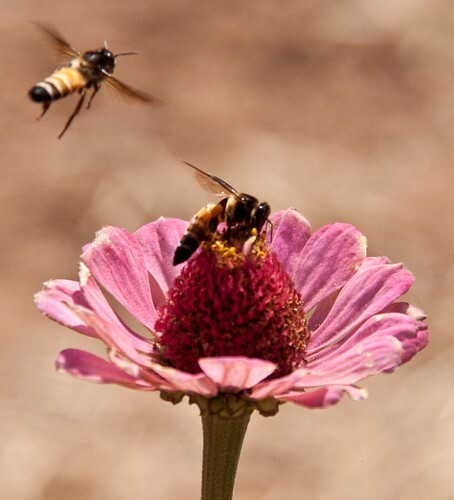 However, human bee sting remedy guinea pig William Brantley, stated in his article, “Sting Operation” that honey soothed the symptoms for only thirty minutes. Um, I can milk it for more than 30 minutes. Hubby bought SSStings Stop for Son #3 for mosquito bites. He said it really helps. See sustainable blogger, Kerry’s favorable review too of this product. As I mentioned above, I used the ice immediately. When the ice cube melted, I tried vinegar and then a tea bag. And finally the SSSSting Stop. I can’t really tell you if the tea bag , the vinegar, or the gel helped because after the ice, I didn’t feel much pain. Hubby bought me Benadryl pills since I broke out last time I was stung. This morning, I feel fine. There is just a raised bump where I was stung. Have you used any of the above remedies? If so, which ones worked for you? Have another remedy for bee or wasp stings? Is there an over the counter remedy that you use? Ouch! My daughter was stung recently. I tried baking soda and water – didn’t do too much, then yogurt (a remedy from my mom) – did nothing for her, then ice water. The ice water worked. It was a pretty bad sting. The itch lasted for over a week. I ended up calling her pediatrician, luckily it subsided. I think she may end up being allergic. I wish I had known about the SSSTing Stop. I will have to get that for her bug bites!